Coniferous evergreens provide a hardy backdrop for displaying plants at the Denver Botanic Gardens. Photo courtesy of Wikimedia. Jump forward thousands of years and living screens gained traction as aesthetic as well as utilitarian elements in European gardens, where some hedges date back 300 years or more. The tradition was introduced in the United States and took root on the large estates built along the eastern seaboard. To this day, landscapes on the east side of the country echo the traditional European aspect with privet (Lugustrum), yews (Taxus), beech (Fagus), and hornbeam (Carpinus). 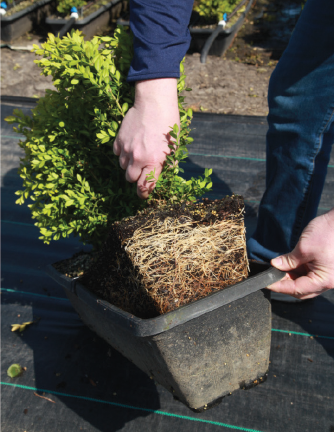 In the west, arborvitae have long — some think too long — been the industry staple. We may be tired of them, but most people are hard-pressed to come up with many alternatives to arborvitae besides Leyland cypress (Cuprocyparis leylandii), laurel (Prunus spp.) and Irish yew (Taxus baccata), which Scott loves but points to its high price tag as a drawback. 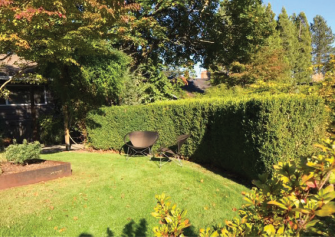 In her own garden, Scott designed a curved boxwood (Buxus sempervirens) screen that she keeps sheered to about 4 feet, though could let grow to its adult size of 12 feet or more. She’s been happy with these Zone 5 plants since Day One. Jay Sanders, sales manager at KG Farms in Woodburn, Oregon, said laurels make up their bread and butter. Skip laurel (Prunus laurocerasus ‘Schipkaensis’), the hardiest at Zone 6, is usually headed to the mid-Atlantic states. Portuguese (Prunus lusitanica), the most unique with a darker green leaf and red stems, goes over well in the Northwest. The glossy green foliage of English laurel (Prunus laurocerasus) sells in California where it doesn’t suffer in the heat. Markus started InstantHedge after consulting with Quick Hedge, a nursery in The Netherlands that sells ready-to-go screens. 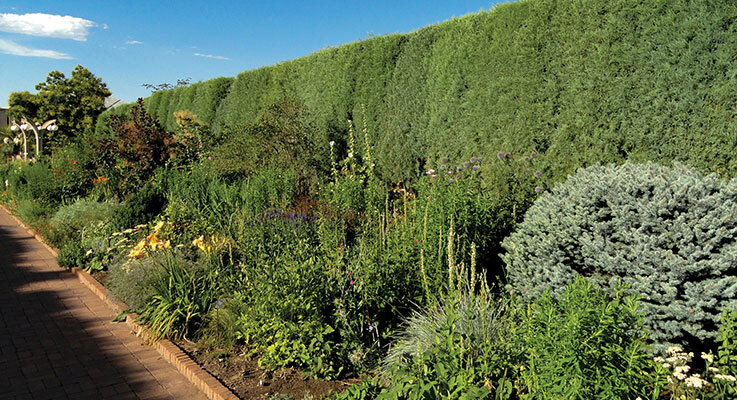 He’s now growing 53 miles of hedge material featuring plants from 18-inch boxwood to 5-to-6 feet tall arborvitae. Most of his stock so far is evergreen, but Markus has plans to add more deciduous. Of particular interest is ‘Flame’ amur maple (Acer ginnala), which he said has a good seed set, is fast-growing at 2 feet a year and a good size at 12 feet tall by 4 feet wide, with handsome fall color. It’s hardy down to Zone 3. Markus is a fan of growing some unusual plants, but said he’ll always grow what the market demands. But deciding on inventory is not an exact science, Markus noted. So he’ll be growing some things that the public isn’t necessarily asking for, like Cornelian cherry (Cornus mas), a small tree to 20 feet. In early spring, it bears a mass of yellow flower clusters before it leafs out, followed by red berries in summer. At Whitman Farms, owner Lucille Whitman suggests some unusual candidates for screening, including Ribes sanguineum, especially the more upright forms like ‘Pulborough Scarlet’ that drips with red flowers in early spring, and Callicarpa bodinieri ‘Profusion’, with its multitude of eye-popping purple berries. Both are about 8 feet tall, though can get bigger, and would need pruning to shape them into a formal screen. Bizon makes a distinction between a hedging tree, which you can’t see through, and a screen, which you can. Screening trees would typically be planted on center with a gap from the ground of anywhere from 36 to 48 inches. Hedging trees have to be sheared at least once a year and may be limbed up as little as 4 to 6 inches. Examples of screening trees are upright oaks (Quercus) such as ‘Regal Prince’, ‘Kindred Spirit’, ‘Green Pillar’, ‘Skinny Genes’ and Crimson Spire™ Oak (Quercus robur × Q. alba ‘Crimschmidt’). Others are Liquidamber styraciflua ‘Slender Silhouette’ (sweetgum), European aspen (Populus tremula erecta) and flowering crabapples (‘Emerald Fire’ and ‘Purple Fire’). A side-by-side view of Crimson Spire™ Oak (Quercus robur × alba ‘Crimschmidt’) in 2009 and in 2018 at McMenamins Edgefield in Troutdale, Oregon. Photos courtesy of J. Frank Schmidt. Nancy Buley, communications director for J. Frank Schmidt & Son Inc. in Boring, Oregon, will raise her hand for oaks, as well. Crimson Spire™ Oak, she said, stays super narrow but reaches 40 feet tall, has dark red foliage in fall and is hardy to Zone 4. Its adaptability means it can be used in a wide variety of locations, most commonly in the Midwest, Rocky Mountain states, California and across the Pacific Northwest. Russet-brown leaves hold on well into December or January, longer than other fastigiate oaks. A good example of a hedge made of Crimson Spire™ Oak is between two parking lots at McMenamins Edgefield in Troutdale, Oregon. 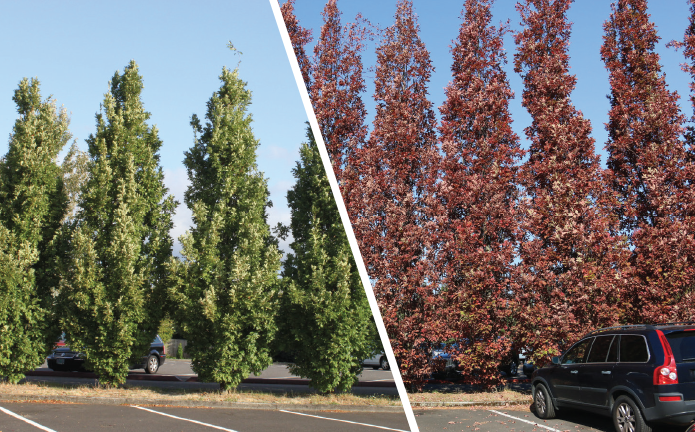 Streetspire® Oak (Quercus robur × alba ‘JFS-KW1QX’) is a newer cultivar of the same cross as Crimson™ Spire. It loses its leaves earlier, and completely around Thanksgiving. It’s hard for Buley to cut her list down, but she puts at the top Parrotia persica ‘Persian Spire’ and ‘Parkland Pillar’ birch (Betula) for a smaller screen and, in addition to the oaks, ‘Mountain Sentinel’ quaking aspen (Populus tremuloides) and ‘Armstrong’ and ‘Red Rocket’ maples for larger. ‘Persian Spire’ is low- and dense-branching compact tree that grows fairly quickly to 25 feet and is hardy to Zone 5. It was discovered as a seedling at John Lewis Propagation Nursery (JLPN) Inc. in Salem, Oregon. Discovered in Manitoba, Canada, and introduced by Bailey Nurseries, ‘Parkland Pillar’ birch (Betula platyphylla) has the white bark customers love, is low-branched, dense-foliaged with attractive, dark green leaves that crinkle round the edges and turn golden in fall. This New Editions plants climbs up to 40 feet and is very hardy — down to Zone 3. ‘Mountain Sentinel’ quaking aspen is also a Zone 3 tree. It only gets 8 feet wide but soars up to 35 feet. These Zone 4 maples get big, too, up to 40 feet and only 12 feet wide. ‘Armstrong Gold’ is more dense than ‘Armstrong’ and glows orange-red in fall. ‘Red Rocket’, as the name implied, explodes in red. The pros of screens are many — privacy, less wind and noise pollution, crime deterrent and wildlife haven — but the cons are few. In fact, the only disadvantage is keeping some of the more vigorous plants within bounds. Not a bad tradeoff. Kym Pokorny is a garden writer with more than 20 years of experience writing for The Oregonian (Portland, Oregon) and other publications. She is currently a communications specialist with Oregon State University Extension Service. Kym can be reached at kym.pokorny@oregonstate.edu.